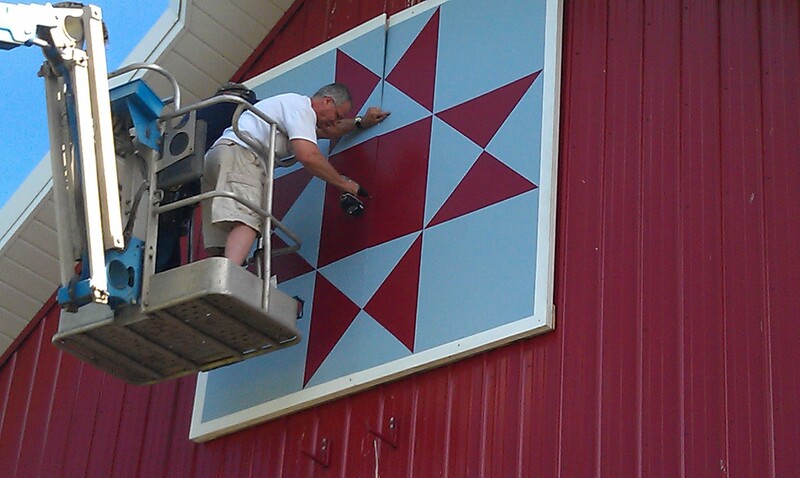 This is a full front shot of the Mader Barn, wearing it’s new Ohio Star Quilt. This picture was taken the first week of July 2012 – which is sort of amazing because the crops behind the barn look like they are nowhere near ready for harvest. The weather turned hot just in time. But, hey – that’s not what this blog piece is about! Here’s another one – played with the contrast on these for fun. 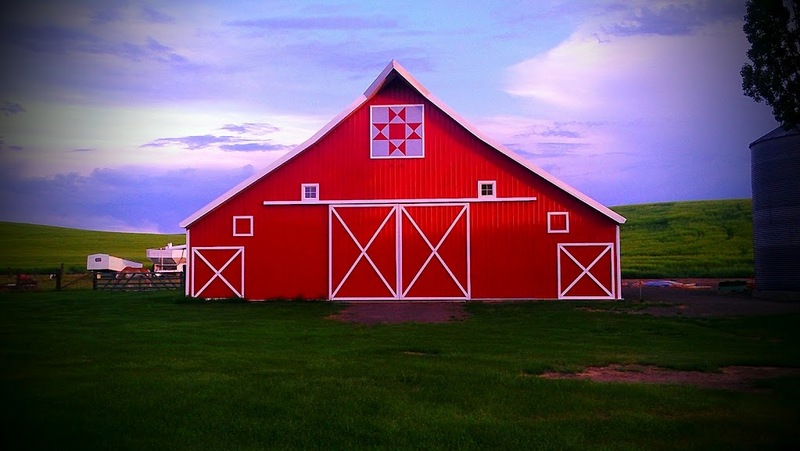 I love how the sky behind the barn turned purple and pink! I caught the lighting just as the sun was going down – love it! So, I left you hanging last time when Mom had chosen her quilt pattern and colors for the barn. I think her challenge at that point was, how in the world do we get this ‘quilt’ manufactured and installed???!!! Mom has lots of friends, more than I can keep up with. She was sharing with her friend from church, Taun, her dream about having the Ohio Star installed on the barn. Historical Rabbit Trail: I feel the need to insert a little family history here. The barn belongs now to one of my older brothers, Dan, who lives and farms around Genesee, Idaho, a region known as the Palouse. My parents bought this farm in the 1960’s, and as it had originally been built probably around the turn of the century, they had to put quite a bit of work into a complete remodel of the home before they moved the family in. The barn was part of the property as well, but I’m not sure when it was built. Dad and Mom moved into the house in the mid 1960’s with my three oldest siblings. Along came my brother and then me. Family changes later in 1980 lead to the farm being rented out to various people including yours truly for a short stint from 1994 to 1996. In mid 1996, my brother and his wife moved to the farm. Their family grew by two and now the happy foursome lives, works and plays on the farm. And, the best part is – I get to go visit them with my three young ‘ins ones whenever I can!!! I feel so blessed that my childhood home is still in the family! So many memories here! Back to business… Mom was talking to her friend, Taun, about the project. Probably wondering out loud how she was going to get to the next step of making her dream of a barn quilt a reality. Taun listened for a while and finally offered to make Mom’s barn quilt for her. Mom was taken aback because Taun, you see, is an Associate Pastor at her church (Orchards Community Church, Lewiston, Idaho) and she quizzed him as to why he would be interested in a project such as this. Taun explained that there were two main reasons he would be interested. First, because his Mother resides in Tillamook County, Oregon (if you aren’t familiar, please refer to my first post on the barn quilt). 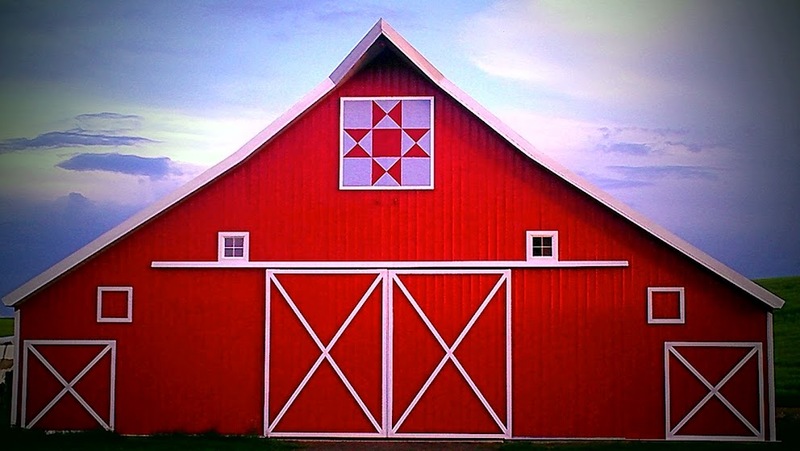 Taun shared that his mother had talked about Tillamook County’s famous barn quilts, so he knew of the concept. And, (get this!) commercial signs were right up his alley, since he put himself through college creating and installing such displays. Ba-BAM! 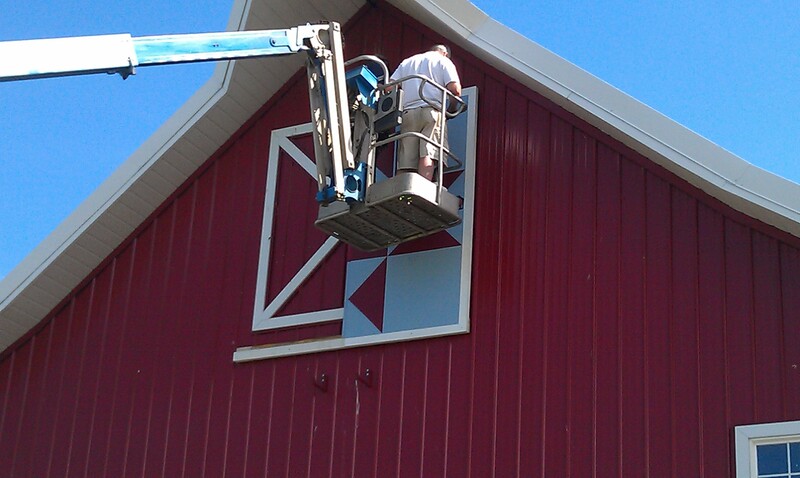 Another God-arranged moment, putting the right people together at the right time… a meeting, some paint, some plywood, and voila – a barn quilt is born. I like to think that God actually winks when these ‘coincidences’ happen! I also think that Taun didn’t know what he had gotten himself into because the next thing HE knew he was atop one of those cherry-pickers (maybe against his better judgement and quite despite the rumor that heights are a challenge for him), hammer in hand, installing the barn quilt. It is pretty difficult to say no to my mom… after all! 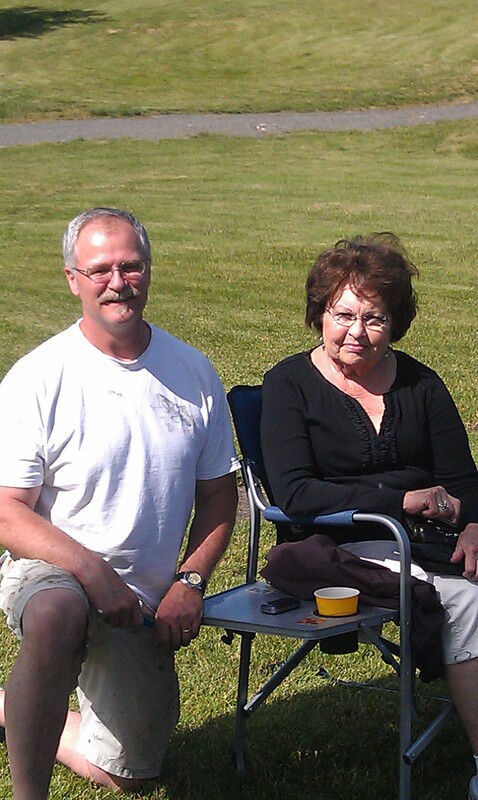 I understand that installation day was a gorgeous spring day in May of 2012 – the rain had subsided for the event – the sun had come out, and Mom had her lawn chair parked at a vantage point where she could oversee the entire operation. My brother sent me these pictures. Mom is absolutely giddy; this makes my heart happy. There’s still more to the story – it involves another barn in the region, a high school English teacher of mine, and that old-fashioned soda fountain tie-in I promised. PS – Thanks a bunch Taun!! !